Stir together the shallot and vinegar in a medium bowl and let stand 3 minutes. Whisk in 1 tablespoon extra-virgin olive oil. 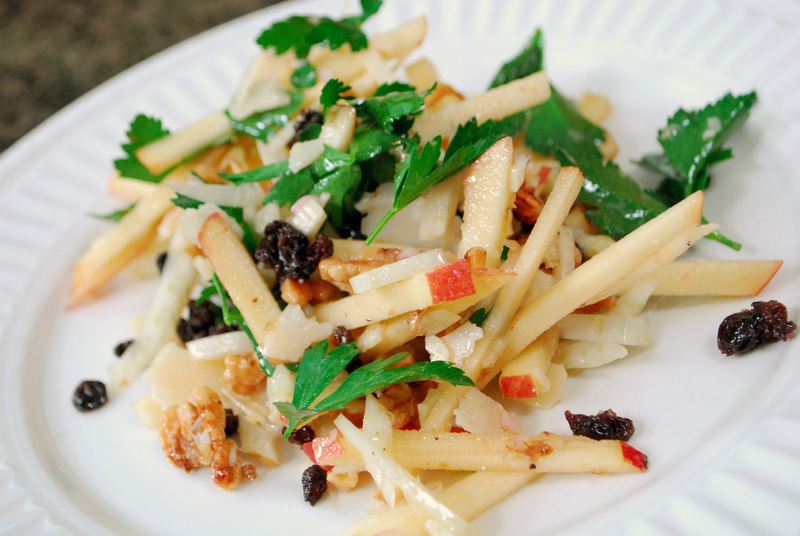 In a medium bowl combine apple, fennel, currants, walnuts, and parsley. Drizzle in half the dressing or to taste. Season to taste with salt and pepper. To serve, divide the salad among 4 large plates and lightly drizzle extra-virgin olive oil over each salad. Using a vegetable peeler, top each serving with some shavings of Parmigiano-Reggiano. Enjoy! This was so easy and delicious! Do not have a mandoline so just cut apple and fennel into matchstick pieces. Left out parm as I do not eat dairy. Used rice wine vinegar. A new favorite! Went well with a Fall dinner that included roast chicken, delicata squash, and braised leeks from this website (the leek portion that goes with a tilapia and leek recipe). I look forward to exploring more recipes here! I first saw this recipe being prepared on a television show a couple of years ago. I made it, and my husband and I enjoyed it so much, it became dinner. No leftovers, it was that good! I’m so glad I found the recipe on the web again, because I needed the refresher of the proportion s of the ingredients. Thank you for this wonderfully tasty, crunchy and satisfying salad! Watched this program on the farm school and was interested in this apple fennel recipe. I went out right away to buy all the ingredients (I’m in the Chicagoland area, used to live in WA) and can’t wait for our farmer’s market to startup again this year. I tried this easy recipe (broke out my mandolin (1 of many kitchen gadgets) and it was so easy and definitely a garden fresh choice for my son and I for dinner. Thank you. I enjoyed the program as well.